I was pretty hopeless on that, I can't remember exactly how I approached it but I do remember that it was nothing worth remembering. Any suggestions on good ways to attack stuff like that? I'm from the land where you get the occasional 1m moss-covered rock in the middle of a forest. If you figure out rocks let me know, but on the above example I'd probably head for the high point directly west and come in off that. There's also a massive looking boulder directly north (before hitting the high point) that you may be able to use as an attackpoint. There's nothing north or west of it so it should be fairly obvious. I agree with tRicky. In complicated rocky terrain try to see through the black and grey to the contours and use them as much as possible. That's the strategy TdSC used for his great result at WOC in OZ. Simplifying the map detail is really important. Looking for the contours is a great way, as is paying attention only to the big rocks or those with a stand-out shape. Another technique that can work well on map like this one is to focus on the shape of clusters of rock rather than individual rocks. For control 8, a safe route would be SW past the bare rocks, through the gap in the green, then swinging south to attack the control from the N, with that enormous boulder tRicky mentioned as an attack point. I imagine that boulder would be easily identified as you approach the top of the hill. The high point or the big boulder are the obvious attackpoints. ^^^This is how I would wish I had approached it after studying my map afterwards and seeing how obvious it was :-) Instead I'd have probably gone straight line through all the rocks. It helps to work backwards from an attackpoint when route planning. As markg and Juffy suggested, the large boulder should be OK. I'd approach that going SW from the end of the shallow reentrant to the north (sort of an attackpoint for the boulder). So I might be thinking leaving control 7: Keep right, go over the ridge and down into the shallow reentrant. By keeping well to the right, I know I can simply turn left up the shallow reentrant (it's really a handrail), looking for the rocks on the right and the others straight ahead then SW to the large boulder. Juffy, can you draw how tRicky would actually execute the leg please? I'd first go over and see if the 712A existed on the ground. And if not, you'd just happen to conveniently have a can of spray paint with you? But seriously, it's relevant to keep track of what you've actually passed by, in order to relocate when you don't turn out to be quite where you expected to be. This works *most* of the time on rogaines. I couldn't keep track of all those rocks. Dan, thanks for starting this discussion and high-fives to everyone else who is added some positive input to this thread. I have learned a few tricks, cheers! Not keeping track of all those rocks might be a good (though not the only) strategy. When there are that many, looking for what's more unique may be a good approach, as some have suggested. Topography, or a combination of topography, vegetation and rock that's distinct, could be a good way. By the way, mapping (even a very small area) is a good way for learning to navigate using various kinds of features. Included in there is the advice "In short: Don’t use stones as a basis for your navigation in an area full of stones.". But also advice on what to do instead. Great article. The visibility maps are an interesting twist on map simplification, and the full speed, no mistakes strategy is the logical use of this. Worthwhile next techniques for those who've mastered map reading. I wonder whether training camps here in North America feature these skills/techniques/strategies? That control is actually quite obvious, due to the open areas and the contours! 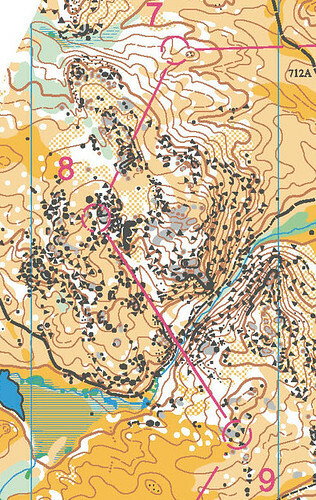 The proper route is pretty much identical to Juffy's dotted line, where you run uphill on a bearing, then turn left in the open just underneath the top, and then cut over when that becomes clear. The attack point is probably the huge boulder just north of the control, but the contours are the main indication that you are on the right approach. The really important advice is to simplify and look for stuff that will stand out, instead of trying to identify individual boulders. 1. For the most part, on those maps you are running fast through relatively simple terrain. Then all of sudden you come to one of these extremely complex rocky areas. A huge change of gears - both physically and mentally - is required at those points. 2. In those rocky areas, only the most prominent rock features are shown on the map. There are in fact many, many more rocks in the terrain than shown. It is very easy to get completely confused in the middle of one of those rocky areas. Push over one of the rocks and see which one moves on the map. @tRicky: I've been in a similar situation many times, i.e. I see something live as I walk/drive past it and immediately want to zoom in on Google Maps/Earth to see it from above. It usually takes a second or two to realize that this is still Hollywood magic, even the NSA isn't capable of this (yet). The NSA can obviously do this for any given location as long as they have some warning time to set it up, maybe even sending in a drone for high-res images and film. Doing it at once for an arbitrary spot on the planet's surface is still not even close to possible. I.e. the maximum resolution for an optical telescope in low Earth orbit is given by the diffraction limit. Even if you play the kind of the tricks that have allowed Intel & co to keep shrinking optical lithography feature sizes way below the wavelengths used you still get less than an extra order of magnitude. Juffy has the correct answer, for me at least. Going up the hill from 7 you should be able to see the two big rocky hills; aim for the saddle between them. Then you are looking at the rocky hill that 8 is on, right in front of you. Go around the left side of it and up, and look for a smaller saddle which might be hiding behind a humongous rock. Keep an eye left while running through the saddle and you should see it. Bit late to the party here but JimBaker, these techniques are the foundation of pretty much everything we do with advanced Juniors here in the USA. Any training camp I run (which was not much this year, thanks to Team Trials) will also include them. Loved Juffy's visualisation of rocks and not rocks! Back when there was no thumb compasses orienteers took bearing and picked up distinct visible features further away and aimed for them. Those who were able to estimate distance, keep direction and identify features ran full speed, no mistakes. Then came thumb compasses and orienteers began to read details around them (instead of further away) and run with constant map contact. Those who mastered it didn't do mistakes. But were a bit slow compared to those who still figured one does not need to read everything. The problem is lots of young orienteers get/got stuck to this intermediate level navigation (= constant map contact by reading visible features around) without either ever realizing there is still one step to take to become elite, or that constant map contact becoming a bad habit, something really difficult to get rid of. TGIF did great job illustrating that problem and making lots of youngster (and coaches) more aware of this problem. Sort of absurd / silly, first we learn how to keep constant map contact and then we learn how not to keep it. But one must understand map well to take the next step and that can't be done without mastering the map contact thing. The question is how kids should learn to navigate / read map without developing that bad habit? Use base plate until 18 years old? Well, not necessarily. Young athlete should run a lot with map, but one can't run all the time at full speed (for physical reasons, injuries/overtraining), so there must be plenty of a bit lower intensity orienteering as well and that's slow enough for reading everything and introduces possibility to develop the illustrated common nasty habit. This is something coaches if young orienteers should think about. 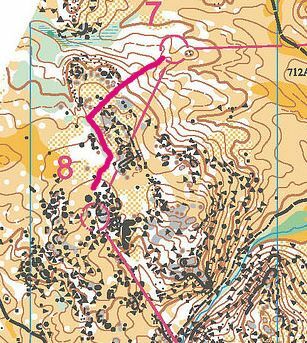 My personal secret back when I was teenager was running plenty/most of my easy intensity trainings with a "read map only twice per leg" style soon after learning how to keep constant map contact. That forced me to navigate about like the way I did at full speed even if I was moving slow (and as a bonus I learned how use compass and estimate distance and use memory). But there is other and possibly better ways, the key is to know the danger exists and coach makes sure it gets worked around one way or an other. Learning to keep map contact is really the first step in learning to locate or relocate oneself after a period of ignoring the map.